Have you ever wanted to take a round the world trip? What are your travel dreams and aspirations? Where do you most want to go? Is there a historical site, monument, city, a place that you’ve always dreamed of? Or maybe it’s about doing something active like hiking the Great Wall of China, seeing the northern lights in Iceland, or observing wildlife in the Galapagos Islands. If you could go anywhere at all, where would you go? Have you created a bucket list? Lately it’s become pretty clear to me that travel is going to be a big focal point for the rest of my life. I don’t travel as much as I’d like to, yet, nor have I even begun to scratch the surface of all the places I’d like to see. But most anything is possible if you want it bad enough. It just takes some planning, time, and yes, a bit of cash. I believe an important step to reaching your goals and making dreams come true is to write them down. In fact, there’s scientific evidence that if you write a goal down on paper, you are more likely to remember it and follow through. Having said all that, I thought I’d better walk my talk and create my own travel bucket list. 1. Scotland: I love photography, particularly landscape photography. Scotland definitely fills the bill. History and landscapes in the Scottish Highlands, beautiful cityscapes and architecture in Edinburgh, and the white sands of Morar. That’s just for starters. 2. Germany: Driving the romantic road beginning in the north at Wurzberg and ending at Neuschwanstein Castle, which I have wanted to see since I was as young girl, though I no longer have romantic fantasies of meeting up with a prince in the Bavarian forest. 3. The Orient Express: I’d like to take the train from London to Venice. The Orient Express is the epitome of elegance and retro travel. 4. China: I read a lot of Pearl S. Buck novels as a kid, and have always had an attraction to the lives of the Chinese emperors. A tour of China including a trip to the Forbidden City is on the list as well as a tour of the Great Wall. 5. USA: The Grand Canyon. I know I went there on a family trip as a kid, but I have no memories of it. It’s one of the top tourist attractions in the USA. Again, landscape photography is a big draw for me here. 6. Iceland: To see the northern lights. Looks amazing! I’ve seen the Marfa lights out in west Texas, but not exactly the same thing. Iceland is also another area of astounding natural beauty. Plus I hear it’s the ultimate party place. Might be a nice change for me. 7. Canada: I’ve been to Toronto and Vancouver (only briefly), but I’ve still not been to Montreal. The combination of history, architecture, and French culture intrigues me, plus I love places that have small walkable historic areas. I’d also like to go back to Vancouver. 8. Italy: If you read my blog at all you know Italy has to be on the list. For all the obvious reasons: history, culture, language, wine and food, stunning natural beauty, monuments, beaches. Matera is high on the list as this city is so architecturally interesting. It fascinates me that this is one of the oldest continuously inhabited cities in the world – I mean people really live there. Imagine building bridges along this road. 9. USA: California, everywhere, anywhere, because I love California with its endless natural beauty, delicious fresh food, and great museums. 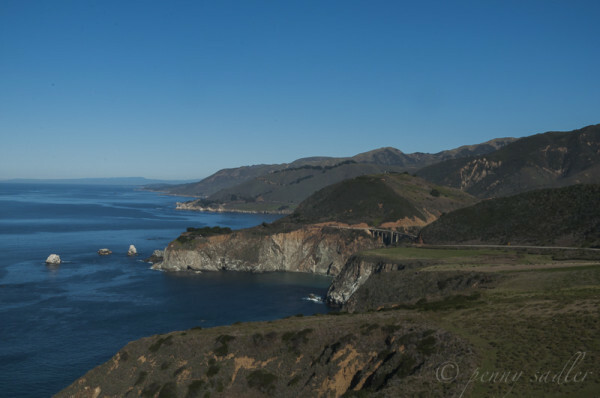 I recently crossed one of my California wishes off my list – driving Hwy. 1 and seeing Big Sur. That was epic. Of course I’d like to do it again, but slower this time. 10. England: Specifically, the Cornwall coast. For the historic castles built during the time of Henry the VIII, and Mount Saint Michaels, the tidal island. This is but a small sampling. I could go on and on, but it’s a start. Really I’d like to go pretty much anywhere in Europe: Paris, Provence, Prague, Munich, Budapest… the list is long. I’d love to hear what’s on your bucket list. After all, we all gain inspiration from each other. Leave a comment below or send me message via my contact page. This is nice. My wife and I are excited for the vacation we’ve booked in Europe to Spain and definitely we will go to the Canary. Tenerife is one of our eyeing place for our 1st stop :).I wanted to know if you have experience traveling to this wonderful Island. Hey Nisha I’m with you, never ever stop! Love this list. Some of them are on my list, especially seeing the northern lights in Iceland. Definitely go to the Grand Canyon again now that you can keep memories of it. You will be amazed at its beauty! Hi Edith, Thanks for the comments. Time, need more of it! Love these – all great places to explore. Thanks for the inspiration! We were lucky enough to visit Iceland a couple of years ago. It is a majestic and eerie landscape that can change from green pasture to black lava fields in just a few metres. If you do get there, I would heartily recommend the Ice Lagoon. I thought it was the most magical place I have ever been! We spent a couple of hours walking a shingle beach that was littered with icebergs, some tiny, some taller than me, and all with sunshine glinting off their blue tinted surfaces. Stunning location! We have the same taste! I would love to visit all of these destinations especially Iceland! Let’s hope for 2015! Great list! I’d love to visit all of those places as well. My bucket list has gotten out of control, I’m constantly adding to it. But I’m spending the next six months in Brazil, so I’ve been working on a South American bucket list for while I’m there. I definitely want to go to Buenos Aires and Mendoza in Argentina, Cusco and Machu Picchu in Peru and Punta del Este in Uruguay – to start! Bon voyage! Kacy great trip ahead of you! I think it’s a great idea to explore one country as thoroughly as possible. have a great time! Well that’s quite a list 😉 Mine is oriented more towards the east. Iran, Indian, China, Japan, Korea yo name a few 😉 And yes to Iceland! I have Iceland on my list – as well as a backpacking trip in Greenland. I’d like to swim with beluga whales in Churchill, Manitoba and bike from Norway to Turkey. My list never gets shorter either. You are a lot more active than I! But I like your style! For sure my list is going to grow. What a nice list! Hope you’ll delete them from your bucket list asap! !